Hello Writers! Isn’t it wild how much writing has evolved with technology over the past decade? We now have access to hundreds of resources at the tip of our fingers to help organize, edit, and perfect our craft like never before. I’ve provided a small list of excellent resources, so you can find the best-fitting application for you! This is an application I used when I first started writing on my laptop. Notebook.ai is a set of tools for writers, game designers, and role-players to create magnificent universes. Many use Notebook.ai to create rich, immersive worlds to set their novels, stories, and plays in. This Notebook asks you questions about your characters and ideas and saves all your answers. With every little world-building fact stored in one place, you can rest easy knowing you won’t accidentally contradict yourself, and you can quickly find anything, anywhere. Even that random thought you jotted down at 3am two years ago. Plan as much as you want in this Notebook, for life! The only limits here are your imagination. Price: Free (must register with an email for an account). Zoho believes in the power of words. That’s why they created Writer, a powerful word processor available across all of your devices. Collaborate with teammates in real-time. Create elegant, inspiring documents for free! They remind writers that even though your favorite timeless writer may have written on paper scraps and napkins, it’s because they didn’t have access to the resources we do. I’m sure they would’ve used them to their advantage too. Let’s say you already have started using those starter applications online and want something more advanced? Personally, I think Scrivener is the best go-to app for writers of all kinds, used every day by best-selling novelists, screenwriters, non-fiction writers, students, academics, lawyers, journalists, translators and more. Scrivener won’t tell you how to write—it simply provides and compiles everything you need to start writing and keep writing. Grow your manuscript organically, idea by idea; an overview of your project is only ever a click away, and turning Chapter Four into Chapter One is as simple as dragging and dropping. $45 Flat fee for Mac or Windows. $38.35 Flat fee for students with Mac or Windows (requires institutional affiliation). $19.99 Flat fee for IOS iPad, iPhone, iPod touch. Another great purchasable application is ProWritingAid. It is a grammar guru, style editor, and writing mentor all in one package. Their software automatically suggests thousands of style improvements, so you can breeze through your editing. Plus, writing can be grammatically perfect but still feel awkward and clumsy, so ProWritingAid searches out elements like repetitiveness, vague wording, sentence length variation, overdependence on adverbs, passive voice, overcomplicated sentence constructions, and so much more. Have any of these applications caught your eye? 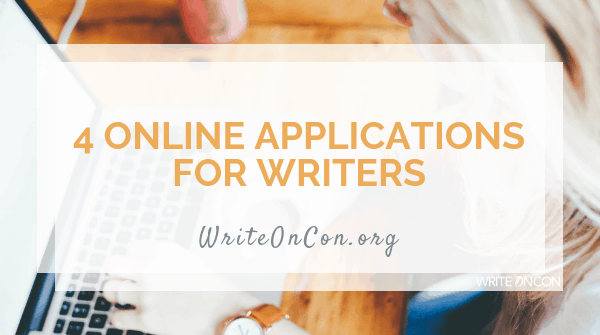 Do you use any other applications that you have found helpful with your writing and would like to share? Do tell us in the comments below!